A near lost south Louisiana classic, calas are a flour and yeast fritter, made with cooked rice and flavored with sugar, cinnamon and nutmeg. I've certainly mentioned this before, but we eat a lot of rice here in the Deep South, and there's almost always some leftover. 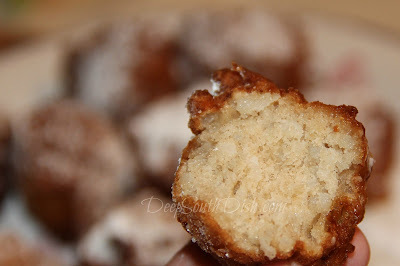 We have lots of ways to use that leftover rice (just click that link to see a few) including sweet things, like rice pudding and these sweet rice fritters, called calas. A near lost classic, Calas hold a past in the city of New Orleans, though their origins date back more likely to Africa. 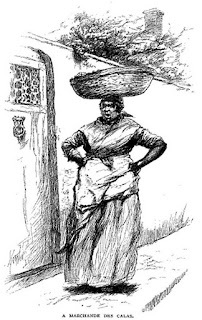 In the French Quarter, Cala ladies would wrap fresh, piping hot Calas in towels and carry them in a covered bowl on top of their heads, hurrying to the streets to sell them, shouting "Calas, belles calas, tout chauds!" If you've never heard of calas before, think in terms of the sweetness of rice pudding meets the fluffy texture of a beignet. They're maybe a little more closely related to the beignet family than a fritter, since they, at least originally, were made with yeast. Once baking powder became more widely available (and virtually every modern recipe) the yeast was skipped over by using baking powder instead. Y'all know me though. I'm going old school. Although there are handwritten dictations of recipes dating back to the 1800s, the 1901 Picayune's Creole Cook Book is believed to be one of the last known written cookbook recipes from the original Cala ladies. It's a tad bit more involved than this, requiring an overnight rest for the yeast mixed rice. It warns to take care not to let the fritter touch the bottom of the skillet, but rather that it should be kept where the cala simply floats on top of the preferred fat of hot lard. Like any doughnut, these don't really keep well, and should be consumed right away. Serve warm right from the fryer with a generous dusting of powdered sugar, or drizzled with pure cane syrup, or your favorite preserves or jam (fig is especially good) and a piping hot cup of café au lait. Calas included some savory versions as well back in the day, usually made with bits of leftover meats and standing in for bread at lunch or supper. History shows, however, that the ones more well known, and those that spark the most fond memories, are of the Cala ladies and their beautiful, piping hot, sweet calas. As always, when working with yeast, unless you are a frequent baker, I recommend blooming the yeast first to make sure it is still active. This is just a matter of mixing the yeast with some sugar and a little warm (110 degree F) water and letting it rest for about 10 minutes. When it puffs up, you know the yeast is good. If it doesn't, throw it away and start off with fresh yeast, otherwise you will not be happy with the results. Mix the yeast, 1 teaspoon of the sugar and water together. Let it proof for about 10 minutes until puffy. Whisk together the flour, remaining sugar, cinnamon, nutmeg, and salt. Stir in the proofed yeast, rice and egg; cover and let sit at room temperature for 30 minutes or up to 1 hour. 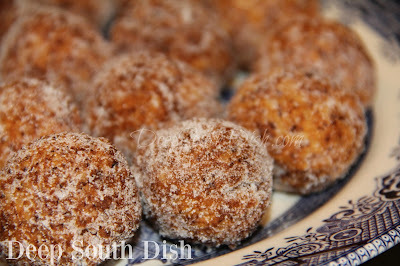 Preheat fryer to 375 degrees F. Scoop fritters using a spoon or a small cookie scoop and form into a ball. Gently transfer to fryer and fry until golden brown, turning once. Remove and drain on a rack over paper towels and serve warm, sprinkled generously with sifted powdered sugar, or drizzled with your favorite preserves, jam, or pure cane syrup (like Steen's brand) and with a piping hot cup of café au lait. I totally forgot about callas. Thanks for reminding me. Need to make some soon! Thanks for the recipe. You always take me back to my childhood. You're welcome DeeDee! Hope you give them a try. We've heard of these before from a Cajun cook on a PBS show. Can't wait to try this recipe, but also try them in person in New Orleans this coming April when the American Iris Society holds it's national conference and garden tours there! You forgot to tell us in the recipe What to do with the Yeast after it rests for 10 Minutes!!! Oops, thanks for letting me know. I've corrected that in the instructions, but you stir it into the flour with the rice and egg. I love you recipe for for the Creole rice fritters, however your photo shows something red atop them in a cross shape over the fritters, could you please tell me what type of sauce you used over them? That is the drizzle of Steen's cane syrup referenced to at the end of the recipe. You can also serve these with your favorite preserves or jam.